1.Cut two pieces of white card to 20 x 15cm, score at 1cm in on the longest length, repeat on the opposite side. 2.Turn the card over and score at 2.5cm then repeat on the other side. Repeat the first two steps on the second piece of card. 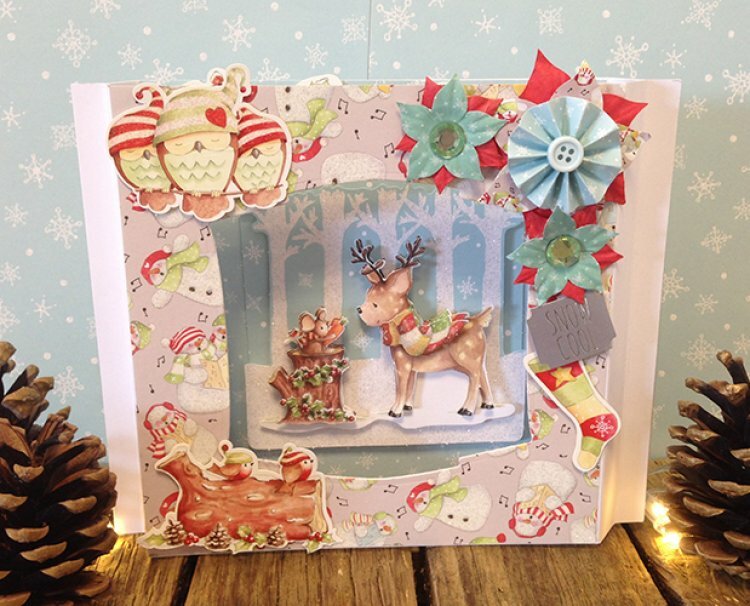 4.Add blue snowflake paper to the second piece of card, the side with the flaps pointing up, build the decoupage and stick to the centre of the snowflake paper. 5.Stick the two pieces of card together by gluing the 1cm flaps together. 6.Decorate the front of the card with glitter stickers, paper blossoms, accordion flowers, gems and a sentiment topper. A stunning festive Christmas card to wow your family and friends with the cute hand drawn Helz Cuppleditch images; we can’t wait to see your own versions in the Project Gallery!